UltraPly™ TPO Flex Adhered is perfect for corners, angles and giving you an edge. 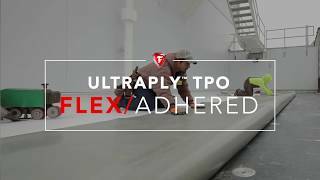 UltraPly™ TPO Flex adhered is engineered to be more pliable for easier installation on more complex roofs and maintains flexibility in cold weather. It's also designed to make it less difficult to find weld settings that will achieve reliable welds. Plus, TPO is environmentally friendly and delivers benefits like lower roof surface temperatures, greater energy efficiency, superior puncture resistance against hail and enhanced indoor comfort. *Based on the Taber Stiffness testing versus best-selling competitor TPOs. For adhered applications only.